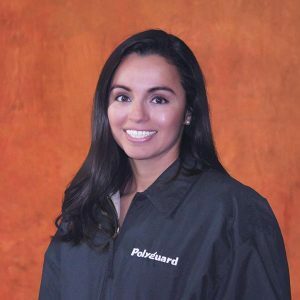 Polyguard has announced the promotion of Karen Zambrano to Associate Engineering Specialist for the Mechanical Division. Karen’s primary responsibilities will be supporting Polyguard’s specification effort targeting the engineering community; attending job installations; assisting customers with technical inquires; and introducing Mechanical products throughout the Southern Region and other strategic opportunities in North America. This new position will help support the growth Polyguard’s Mechanical Division has enjoyed over the last five years. Karen joined Polyguard in 2016 working as Executive Assistant for the CEO and President. In her time at Polyguard, Karen has shown an ability to master new skills and a willingness to tackle unfamiliar tasks to achieve personal growth and help the company. Karen is most recognized for taking the initiative to learn different aspects of the manufacturing business while completing a wide-range of corporate, manufacturing and sales tasks. Karen has both a BAAS degree from the College of Science & Engineering and Master of Science in Management degree from the College of Business at Texas A&M University-Commerce. Karen will be working under both Co-Division Managers Nate Brink and Tony Garone. Tony stated that “Karen’s strong interpersonal skills, ability to adapt to changes, being a team player and helpful attitude made her a perfect candidate for us.” The Mechanical Division specializes in anti-corrosion, vapor barriers, weatherproofing jackets and insulation products for different mechanical systems in various industries. Founded in 1953, Polyguard Products specializes in products which protect surfaces and structures from moisture, water, or other undesired substances. Polyguard is an industry leader in the production self-adhesive protective coatings for engineering and construction. Polyguard is also a 100% employee-owned ESOP with 25 consecutive years of sales growth. If you would like more information about this topic, please contact JC Cody at 214-515-5000 or email at Jcody@polyguard.com. Karen Zambrano News Release 6-18-18.